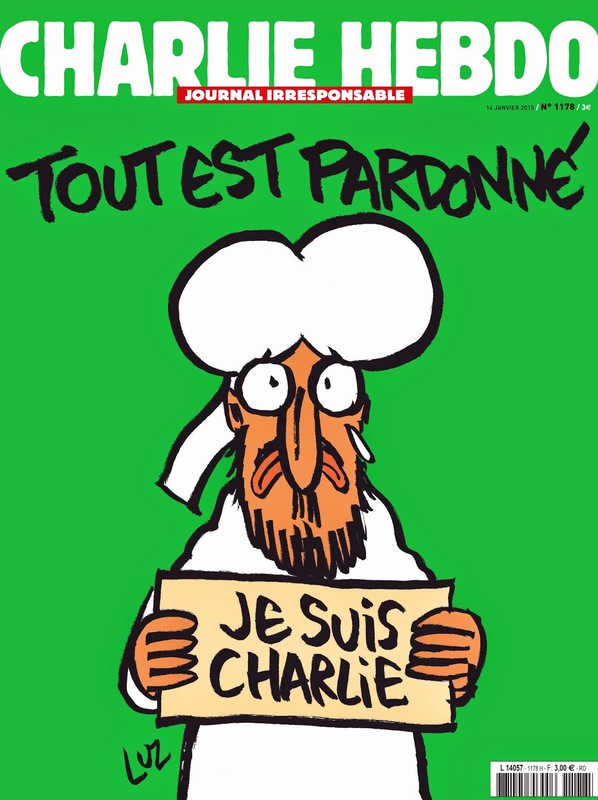 As I'm sure you are aware, Charlie Hebdo decided on their new cover (below). Unfortunately, many of our mainstream news media outlets, including the New York Times, decided not to show it. This rubs me the wrong way, as I believe the image deserves to be seen as widely as possible. Religious extremists should not be able to set limits on free speech. And so, I'm joining with many others around the atheist blogosphere by posting it. I understand that Muslims are not supposed to depict Muhammad. That's fine. I'm not asking them to do so. But those of us who are not Muslim are perfectly free to depict what we want. In civilized societies, we should be able to do so without violent retaliation. Any ideology - religious or otherwise - that uses violence or the threat of violence to suppress free speech is flawed and in dire need of reform. I have little doubt that this image will remain iconic for the next decade. It is not hard to imagine it soon appearing on t-shirts and everywhere else, assuming Charlie Hebdo permits it (and maybe even if they don't). And something tells me that Draw Muhammad Day may be a bit more popular this year than it has in the past. Je suis Charlie, indeed.